I was lucky enough to design flowers yesterday for a very lovely couple. The bride was beautiful and had exquisite taste. Her dress was just beautiful, and her flowers were so elegant. She wanted pale blue and white so I used creamy white roses, creamy white callas, blue hydrangea, blue delphinium, white freesia, white wax flower, white chrysanthemums, clematis, variegated Italian Pittosporum and round Pittosporum. The centerpieces were made with most of the same flowers designed in a white cast iron urn. I also designed a blue hydrangea wreath with blue Midori ribbon trails to hang on the wall in the parlor of the Kenmore Inn. The groom looked dashing in his dress Marine Corp. uniform. His chest was covered in medals - a couple for service in Iraq, one for Afghanistan among others. Anna, his bride, is an Engineer and in the Marine Corp, also. Thank you, thank you, thank you, and and best wishes for a long and happy life together!!!! I cannot wait to get the photographer's photos. I'll post as soon as they are available! You know, there is just no comparison to the photographs of a professional. 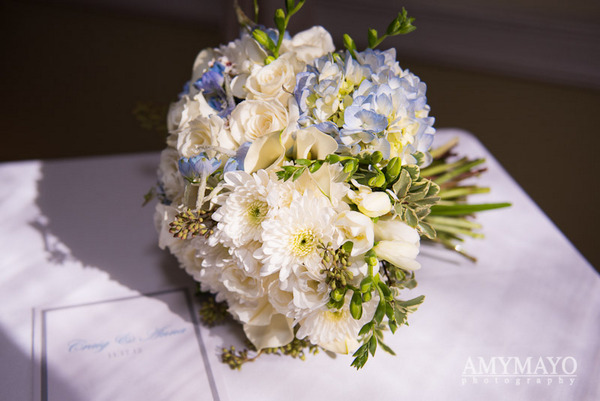 May I share the gorgeous photos from Anna's Blue and White Wedding? It was a classic, and these beautiful photographs reflect the elegant feel of the day. I have had such a busy wedding season this year, that I've not been consistently updating my blog. I think I need a "blogger". Is there such a thing? I have captured a few pictures of some very lovely bouquets from this wedding season. (There are oh so many more. Please stay tuned!) I hope you like them! Each one of these weddings was so special! The brides and their families were just a joy to work with, and I wish them all the very best!!! What a fun "Rustic Chic" wedding I did today at Stevenson's Ridge. What a darling bride, what adorable friends, what a great venue, what a fun, fun day!!! I just had to blog about this cute, special wedding! Now, I have to say that I have lost sleep over this wedding, specifically over the burlap curtains that the bride wanted hung from the wooden pergola at Stevenson's Ridge. Of course, when we were talking about the idea, it seemed like it would be a "piece of cake." As the day got closer, I began to fret. I went to the venue several days ago to closely examine the pergola. Now mind you, I have decorated this pergola several times in the past, but I have never had to engineer any of my arrangements, and I never closely examined the structure. Long story short, I could now build that exact pergola - I know all the measurements and the complete design. See the very cute result of all of my worry and engineering knowledge. This is the side of floral design that goes unnoticed - the mechanics that are involved. The bride's dad made wonderful rustic boxes for the centerpieces. I know he must have loved doing this for his "little girl". See the results of his labor of love. I have to tell you that this little vase of September Whites caused me to lose sleep as well...really. The bride loved chamomile, but we can't get that right now. I used September Whites, which has a completely different growing style, but it has a similar bloom. The first design attempt, albeit on the right track, was not it. The second attempt was not it. I thought about it all night, and when I walked into the shop the next morning, I immediately knew how to achieve the look the bride wanted! That is the amazing thing about floral design...the final look sometimes just evolves through trial and error (and lost sleep)!! The bride loves dahlias and ranunculus. (See the ranunculus on the Sweetheart table above.) The ranunculus are just coming in again, but we were lucky to get what we wanted for the sweetheart table. The dahlias were phenominal. See her bouquet below. The maids bouquets' were lovely pink and yellow roses with seeded eucalyptus and Italian varigated pittosporum. I'll post the photograher's pictures at a later date, but see the bridal party below. Happy married life Shannon and Ryan! You dodged the rain showers, thank goodness, and I know you will live happily ever after!!!!!!!! Roses, Holland Peonies, Dad's Peonies, Hydrangeas, Branches, Flower Garland, Jasmine, Lovely Family...What more can I say? Well, I had the most fun creating the flowers for the bridal party and the reception for this weekend's wedding. The flowers were beautiful - roses, peonies, hydrangeas, jasmine vine - the branches were big and tall, and the family was as lovely as the flowers. One of the most special touches, was the peonies that were cut from the bride's dad's garden and saved for weeks in the refigerator. They were divine, and I was touched to get to work with them. It was a grand weekend. The weather could not have been more gorgeous. Not only for my wedding, but also for my youngest son's dear friend who got married on a farm in Middleburg, and my oldest son's fraternity brother who got married at the inner harbor in Baltimore in an outdoor ceremony. But back to my wedding. I was so excited about this wedding from the initial meeting through Saturday. I love the organic look, which is so "current" right now! It utilizes branches, vines, and an "unruly" look - a look that mimics how flowers grow in the garden. I call it a little "messy", but strategically "messy." It's young, it's fun, it's organic, it's different, it's stylish and it's gorgeous! Oh, and did I say it's big, it's tall, and it requires a ladder. Ha!!! Where am I going with this? My bride and her mom wanted this look. Yea!!!! A few pictures follow, but let me say again what an absolute joy it was to work with this lovely family. I hated to see the work end! This was one of 5 mantles where I used tall branches with gardenesque flowers! 25 cocktail/bistro tables had alternating julep cups and small frosted cubes! I wanted it to look like these flowers were gathered from the garden and arranged in a European hand tied manner! This main mantle with this lush garland was the backdrop for pictures! I cannot wait to see the professional shots. One of my absolute favorite bride's bouquet!!!! Isn't this cake and this very classic topper just gorgeous!!!!! Peonies, roses, jasmine, ivy, gardenia leaves........ oooh, I just love it. A few weeks ago, I attended a fabulous class in New York taught by Nicolette Owen, owner of Nicolette Camille Floral Designs. If you read flower magazines or keep up with the "flower world", then you know that Nicolette is a highly respected, published and admired floral designer. The workshop was titled "Bringing Nature Home", which is the title of a new book by Ngoc Minh Ngo, a well-known photograper. Nicolette designed all of the arrangements, and they are just out of this world! She is so talented, and so gracious! I have taken lots and lots of classes from many different floral designers in New York, and I have to say that they are the most kind, generous, and gracious people I have ever met. I guess anyone with a true love of flowers has to have a generous spirit. How could one not???? The flowers we were able to choose from were divine!!!! Again, New York, New York!!!!!!!!!!!!!! Yes, those are carnations - a new creamy neutral. Everyone adored them. Yes, carnations have reclaimed their original place in history as a beloved flower!!! Just keep the baby's breath and baker fern out of them! Pictures of my design are below! It was such a fun way to spend Sunday afternoon, especially after a walk through Central Park that morning with my husband and Yorkie, Chloe! A weekend to remember! I have spent the last 3 days in NYC just taking in the views, the food, the culture, the history, and, of course, the FLOWERS at the Flower Market on 28th between 6th and 7th. Yes, it is that time of year, and the flowers are outstanding! In addition to the cut flowers, several of the wholesalers have pots of bulb plants - hyacinths, daffodils, tulips, and one of my favorite things - flats of wheat grass! Yes, I do love to see the wooden flats planted with wheat grass. I don't know - there is just something about that look. I will be using something like that for an upcoming wedding, and I can't wait. At any rate, I talked to Cas Trap, owner of Dutch Flower Line this morning. We were talking about the fabulous flowers in his shop today. They looked to be just picked - even the sweet peas from Japan, of all places. Cas and his brother Remco Van Vliet also own an event design company. In addition, Remco does the flowers in the Great Hall at the Metropolitan Museum of Art each week (BIG, BIG, BIG designs), and I have taken classes from both of them at Flower School New York. Cas still teaches at FlowerSchool NY, but Remco and Cas both have started their own flower school as well. They are originally from Holland and their father and grandfather owned a flower shop. It's in thier blood as they say. Oh, do I envy all the floral designers whom I saw this morning picking up their most beautiful flowers for their work this weekend. However, I have them beat when it comes to getting their flowers to their shops. Mine come directly to my door, and I do not have to deal with NY traffic or public transportation. Once I bought flowers for an event that I did at the Union League Club in NY, and navigating the subway with the flowers (and Chloe in her Sherpa) was not easy!!!! Here is a picture of blue Tweedia for one of my upcoming weddings. I wanted to show Kelly what it looks like. The next two are of the view from our hotel room, as I waited on my husband to get back to the hotel from work so that we could go to dinner. We are staying on the West side near the Theater District and I LOVE the restauant called Hell's Kitchen located on 9th between 47th and 48th. We went back their for the second time last night!!! The last time we were here, I think I went there 3 times. Now that I'm thinking about food, I'll show you a picture of the dining "bar" in Pearl Oyster Bar located in Greenwich Village. We ate there on Monday night - again it's one of our favorites. The raw oysters were so fresh - Blue Points. We also had some fried! I had smoked salmon over a Johnny cake with cream fraiche. So, so good!!!!! Please know that when I get home, I'm having Leek Soup for 48 hours like is suggested in French Women Don't Get Fat because I have over-indulged, but enjoyed every morsel and sip. But before that, dinner tonight in midtown at Artisinal!!!!!!! My son and his wife (my beautiful daughter-in-law) just celebrated their one year anniversary. I can't believe it's been one year since that magical weekend. I love to look at all the pictures from the wedding. I wish I could show you more of the events of the weekend. But, here are just a few of that lovely, special event in our lives. I had the ultimate pleasure of designing Caryl's "red" wedding. She and Paul are two of the lovliest people I have ever had the pleasure of working with. They are so in love!! Everyone associated with this couple, in addition to Caryl and Paul, just radiated joy. Caryl wanted the main color to be red, but we knew we wanted to incorporate another color and I suggested pink. Caryl said she wasn't a "pink" person, but she trusted me. I just think pink and deep burgundy reds look so sophisticated together, and I think we achieved that look. However, no pink in the bouquet - all rich reds!!! Wow! What two fine people. Happy married life Caryl and Paul! I have been doing more and more weddings at Stevenson's Ridge in Spotsylvania, Va, and each time I go there to decorate, I fall more and more in love with this venue. I recently had the opportunity to create a lovely arrangement on the pergola on the property, and the photo is attached. I was able to capture the new fountain spray from the lake behind the pergola in this shot. I am waiting on some "real" photographs from the photographer who took pictures that captured the lovely, sophisticated calla bouquets. I'll post them when I receive them. I also just met with a bride who wants me to do her flowers at Stephenson's Ridge next fall. We reviewed all the photos I took of the San Francisco Flower market, and almost designed the wedding while we looked at my pictures. I was so glad that I had them to show her. Yes, a picture is worth a thousand words. Oh my goodness was I in heaven at the San Francisco Flower Market last week!!!! I went to the San Francisco Flower Market to meet with a contact given to me by Ariella Chezar. The first day I went to the market, they were closing at 10:00 am. (They open at 2:00 am. The floral design world is an early morning industry, and those who work on the wholesale side of this business never cease to amaze me.) So, I made an appointment with Barbara to return on Monday between 7 and 8 am. When I got there last Monday, I was speechless. The flowers were phenominal...I mean phenominal!!!! I have never seen such incredible blooms. There are several varieties that are available in CA, after they are no longer available on the East coast, at a reasonable price. There is also more branch and vine material available as well. I also met with a designer in St. Helena, CA (Napa Valley) and we shared experiences. It was so fun to talk about the differences in design on the west coast vs. the east coast. It was a fabulous trip with lots of good food, great wine, spectacular views and flowers galore!!!!! I have already begun to incorporate some of the west coast design concepts into my arrangements, which I think already combine elements of east coast ideas with the unique style of the deep south. I am always evolving! I cannot stand to do the same thing over and over, especially when so many new design concepts are always emerging! Ok, everyone do you see what I'm talking about??? I have to stop uploading pictures, but I have so many more!!! I just could eat these pictures!!!!!!!!! I am so honored to have done the flowers for a wedding that captured the favor of Style Me Pretty. Follow the link below to see a lovely, lovely wedding. It was one of my favorites...white peonies, cymbidium orchids, roses, gardenias...How could the flowers not have been gorgeous? The cake topper really wowed me. It was used on her mom's cake and her sisters' cakes. I think it dated from 1945. What a wonderful tradition. Oh my goodness! I was in heaven this last Thursday night. I attended the Ariella Chezar Workshop at FlowerSchool New York. Every time I think a class cannot get any better, it does. I don't know if you are familiar with Ariella's work, but you should be. She is phenomenal!!!! Not only is she gifted, but she is as gracious and as generous as can be. I mentioned to her that sometimes I have a hard time finding the material that I want, and she offered to help me find any flowers that I am trying to find. I am so impressed and so very appreciative! Let me get back to the topic of her work. She so beautifully combines art and nature. She gathers a lot of her material from the woodlands, which gives such a natural feel to her gorgeous work. I read that her mother was an artist, and this talent has, obviously, been passed down to Ariella. As for me, I hope to incorporate some of her techniques into my work in the future. I have my own style, but some of Ariella's techniques can only enhance my work. We all have those who influence our style, and Ariella is certainly one whose style I adore. She is GREAT!!!! This is my arrangement. It was not easy, as we all discussed!!! The goal is for it to be gorgeous and not look like a "tangled mess." You know, I've taken classes from a lot of extremely talented people, but I think what makes Ariella different (in addition to her work) is her spirit. She is one of the lovliest people I've ever met. As always, I look forward to the next FlowerSchool New York class that "speaks to me." 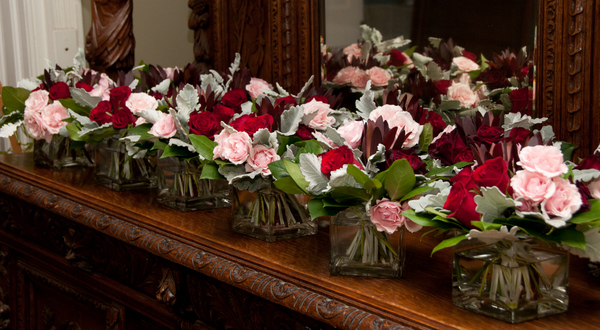 When my son Hammond married Robyn Swift in Palm Beach, Florida, you KNOW I did the Rehearsal Dinner flowers. We held the dinner at Cafe' Boulud in the Brazilian Court Hotel and Beach Resort in Palm Beach. The decor was all tropical - what else??? Oranges, and golds abound in that historic fabulous hotel, so that is what I chose for my color scheme, with a little brown interjected. Mokara orchids, three different orange roses, Uhule fern (fiddlehead) and aspidistra leaves to wrap inside the cube. For the cocktail hour, which was outside in the courtyard around a gorgeous old world fountain, I used roses only in frosted cubes. I think I achieved my goal - very current styling with a nod to the nostalgic tropical flavor of the famously elegant Brazilian Court. Menus, placecards and favor boxes were burnished gold and orange, detailed with Midori Dupioni silk ribbon!The lovely printing was done by 2BSquared Designs. Favor boxes held imported Belgian Chocolate shells and were wrapped with the dupioni silk plaid ribbon. It was a magical weekend!!!!!!!!!!!!!!!!!! The beautiful bride and handsome groom on the way to the rehearsal dinner!!!!! Jane Guerin, flowers provided the centerpieces for the Board Meeting of the American Liver Foundation. 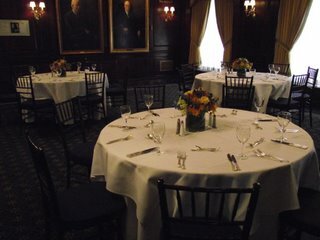 The meeting was held at the Union League Club in New York. I actually jumped at the chance to do these flowers because it meant I could go the the Flower Market in NYC where the flowers will truly knock your socks off!!!! I went to the market early, but not early enough. Some of the most unusual flowers were either gone or almost gone. Even so, I found the most gorgeous, fresh, hard to find flowers. I was in great company, too. I was surrounded by some of the most well-known event planners buying flowers and props for events. It was fascinating to watch them work and listen to the details about their events. I even ran into Charlotte Moss, who I proceeded to introduce myself to. We chatted a bit about the availablility of great and unusual flowers at their peak!!!!! The Union League Club is all gorgeous dark walnut panelling and marble and the carpeting and draperies are blue and yellow/gold. I used blue and yellow flowers with a splash of orange. A few weeks ago, Korie Herold of Korie Lynn Photography invited me to participate in a photo shoot, which she created with C & A Events. The shoot took place at the James Monroe Museum in Fredericksburg, VA. It was so cold that day - I felt so sorry for the "bride and groom," but they hung in there! I wanted to share just a few of Korie's very beautiful photos. She is so good!!!!!! The colors were pink - all shades! Oh, and notice the ruffle cake! You can see more of the photographs from this shoot at www.korielynn.com. ENJOY! How lucky am I to have a very, very talented photographer next door to my studio? After a recent photo shoot, Korie offered to take pictures of my flowers in her very edgey shop! (She transformed her space in our 1826 building into a stunning studio.) Not only is she very talented, she is so very generous, offering to take photos of any of my arrangements and bouquets. I love this picture of my design studio! The following photos are my flowers from the photo shoot, except for the roses in the cube. This is a more contemporary look than we used for the photo shoot, but one that I love! I love all design styles, but my favorite style is a little more contemporary. It's more flowers than filler and foliage - the style I study in New York! I just love winter weddings! I love to use sahara roses with vendela roses and dusty miller. Dusty miller just looks "frosty" to me, and I love it with whites. There was no snow on the ground when we did this wedding, but it was cold and wintry outside. Inside, it was warm and full of smiles, love, and laughter. What a joy to be a part of this "winter wonderland" wedding.